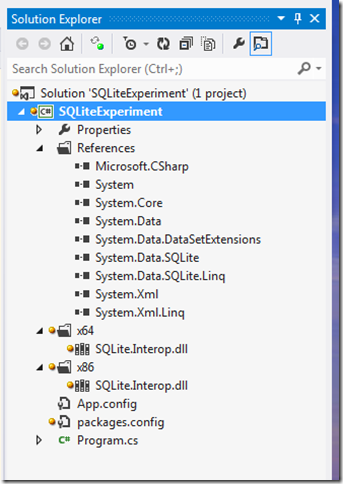 My most popular blog post ever was entitled SQLite on Visual Studio 2010 Setup Instructions which I wrote nearly 18 months ago. A lot has changed since then but the page is still as popular as ever. Here is the replacement for that antiquated post. I’m now using Visual Studio 2012 at home. I’m still using Visual Studio 2010 at work. 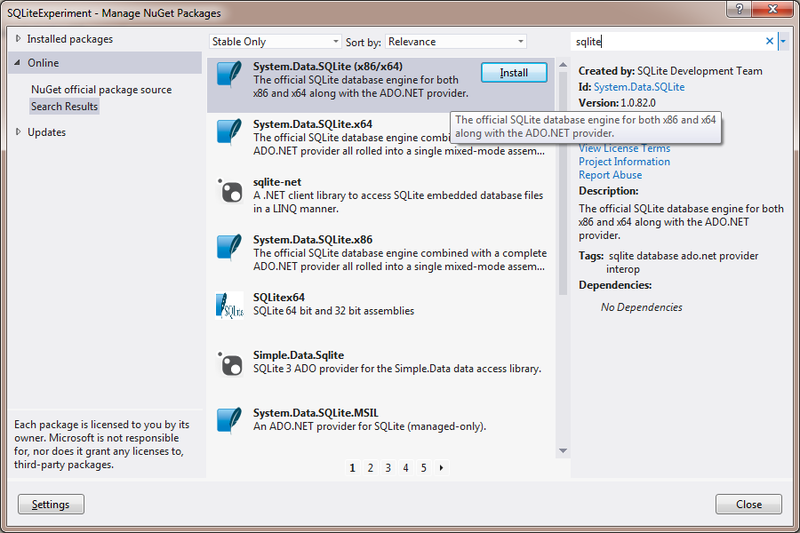 I have tried the latest x86/x64 SQLite NuGet package on both and it works very well. So forget about my post from 18 months ago and read on. If you don’t have the NuGet Package Manager installed, go get it and get it installed. Now comes the fun part. Illustrated and very easy instructions. Don’t worry, we’ll get to some code later on. Save and build. You are now ready for some real code. Yes. It is that easy. So much easier than 18 months ago. Now here’s the test code. This code shows you two approaches in Test1() and Test2() methods. 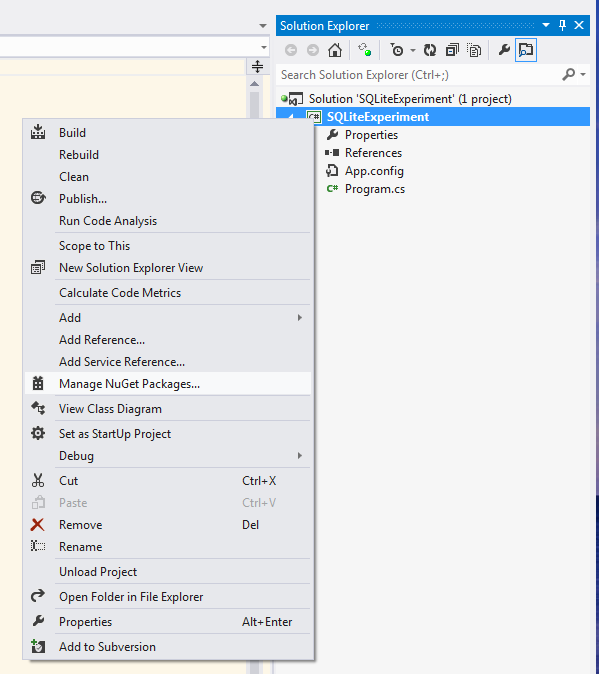 Test1 uses the SQLiteFactory to create a standard System.Data.Common.DbConnection object so that you can plug in your standard ADO.NET code. Test2 uses the System.Data.SQLite namespace and its SQLiteConnection, SQLiteCommand, SQLiteParameter and SQLiteDataReader classes. //      access the file because it is being used by another process. This code is ultra simplistic but illustrates exactly how easy it is use to use SQLite after “installing” the NuGet package. I have not tried to use a visual designer with this package. I’ll leave that discussion to another day. Seven years ago, I wrote a wiki for managing requirements for multiple software development projects. I used C# in a simplistic ASP.NET web forms application with SQL Server as my data store. I published it under the name OpenCollective on Code Project and since then it has been viewed on just over 196,000 occasions and downloaded a little more than 1,600 times. I still get an occasional question about OpenCollective, so a month or two ago I decided to rewrite it in order to explore using SQLite and Fluent NHibernate in a “code first” approach set in an ASP.NET MVC 3 application written in C#. The original OpenCollective was in some ways an experiment with technologies and techniques I was interested in at that time, so a rewrite to learn and explore something new seemed like a good idea. The plan is simple. As time allows, I’ll rewrite OpenCollective and blog about my progress whenever it seems I have something of value to share. With some of these posts, I’ll share the entire code base for download. Others may just illustrate something I’ve learned or something I want to preserve for my own future reference. I tackled the first chore over a month ago but work and other activities pushed this project aside for a while, so I’m just getting around to blogging about the code now. I suspect this will be a priority driven pattern for this project. The first thing I wanted to accomplish in the OpenCollective rewrite was a move to SQLite and Fluent NHibernate in a “code first” approach to replace the SQL Server schema and the old ADO.NET code in the original. Some quick searching led me to the Fluent NHibernate Getting Started page. (If you haven’t read it, do so now.) Combining that with what I have already learned in exploring SQLite in this blog, I soon had a code first database being generated. I’ll attach the entire code in 7zip (saves me 25% in bandwidth over standard zip), so I’m not going to go through all of the code in text here, but I do want to share with you some of the key steps in the my code first with Fluent NHibernate and SQLite adventure. In my last post, I covered getting the Berkeley DB SQL API running under the covers of the System.Data.SQLite library for .NET. Another weekend has come and I’ve had some time to run some tests. The whitepaper Oracle Berkeley DB SQL API vs. SQLite API indicates that the Berkeley engine will have relatively the same read speed as SQLite but better write speed due to it’s page locking vs. file locking. Originally, my code would write a certain number of rows in a given transaction on one or more threads and then read all rows on one or more threads, but I had to give up on my read code because the Berkeley implementation of System.Data.SQLite threw a "malloc() failed out of memory" exception whenever I ran the read test with more than one thread. You can read the code below and decide for yourself whether I made a mistake or not, but the test ran fine with the SQLite assembly from the sqlite.org site. There were four tests, each inserting similar but different data into a single table with a column representing each of the main data types that might be used in a typical application. Two single threaded tests, the first inserting 6,000 rows in a single transaction and the second 30,000 rows. The third and fourth tests were multithreaded: 6 threads inserting 1,000 rows each and then 10 threads inserting 500 rows each. The results do not show a vast difference in insert speed for Berkeley as I might have expected. The tests were run on an AMD 6 core machine with 8GB of RAM. I’m writing to an SSD drive which may or may not affect results as well. You may choose to interpret the results differently, but I don’t see enough difference to make me abandon the more stable SQLite 3 engine at this time. I invite you to review the code. If I’ve missed something, please let me know. It’s pretty straightforward. With each test, I wipe out the database environment entirely, starting with a fresh database file. I use the System.Threading.Tasks library. 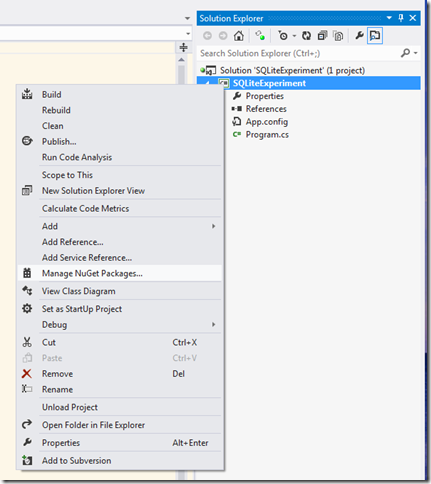 I wrote about getting SQLite up and working in Visual Studio 2010 and your .NET 4.0 projects in June. Then I got distracted with work and didn’t have a chance to come back to my exploration of SQLite until today. So I decided to look to see if we have a new version. Yes, the new System.Data.SQLite install for 1.0.74.0 (SQLite version 3.7.7.1 which includes a few bug fixes) is ready to download and install. Download and install my favorite free SQLite admin tool from http://osenxpsuite.net/?xp=3. Download the latest from http://system.data.sqlite.org/index.html/doc/trunk/www/downloads.wiki. In my case, it was the sqlite-netFx40-setup-bundle-x64-2010-1.0.74.0.exe. This will have removed some GAC items and NOT put 1.0.74.0 into GAC. At least on my machine. I could not get the assemblies into the GAC to save my life. Make sure your project references are pointed to the correct version and that you have Copy Local set to true. 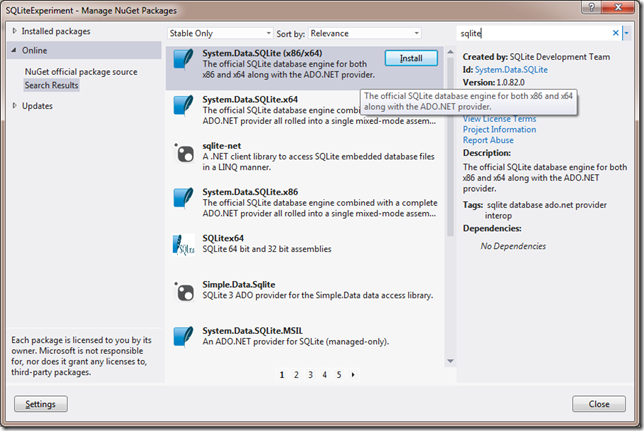 Go to the new SQLite on Visual Studio with NuGet post instead. Be sure to read upgrade instructions I've just posted as a follow-up to this post. I’m just starting to play with SQLite and the System.Data.SQLite library created by Robert Simpson and taken over by the SQLite.org folks. In attempting to get things working in Visual Studio 2010, I ran into a few issues, so this post is as much a reminder for myself as it is a help for other .NET developers who wish to use SQLite from within Visual Studio 2010. The current binary installers from sqllite.org for the System.Data.SQLite .NET assembly do not include the Visual Studio designers or the ADO.NET driver required for use of SQLite in the Server Explorer. So here’s the winning combination I’ve found for getting my environment set up properly. Download and install version 1.0.66.0 from sourceforge.net because current binary installs on SQLite.org at system.data.sqlite.org do not include the Visual Studio designer or ADO.NET driver install. Download and install the latest versions (x86 and x64) from system.data.sqlite.org (currently 1.0.73.0 which contains the SQLite 3.7.6.3 engine). Important Note: If you have Visual Studio 2008 and 2010, be sure to choose both when prompted as I found reports from others who had problems otherwise. Copy the x86 binaries into and overwriting file at C:\Program Files (x86)\SQLite.NET\bin (assuming you used the default install location for version 1.0.66.0 and you're running x64 Windows). And if you are on an x64 box, copy the x64 binaries to the C:\Program Files (x86)\SQLite.NET\bin\x64 directory, overwriting existing files. With a new data connection, you can use the table designer, but it has limitations and it’s probably not the best approach with an embedded database engine from a development perspective anyway, since generally you’re going to want your app to be able to create the database from script embedded in code. UPDATE (30 minutes later) Just a bit more testing reveals that I missed one step. Very important to know and use. First, I reinstalled the x86 and then x64 latest installs and checked the checkboxes to install to the GAC and modify the path. Then I ran “test” from the command line and after modifying the connection string by giving the file a path like C:\temp\test.db, the tests ran fine. Looking at the chm help file and the test.exe.config revealed the trick I needed. Rebooting, just to be paranoid. And now, run the same test after commenting out the local app.config’s <system.data><DbProviderFactories> node and everything works as expected. No more bad image exception. And the Data Connection designer continues to operate as expected. Now on to some real coding.